← JOHN MENADUE. Four waves of economic and strategic relationships – UK, US, Japan and China – similarities and differences. CLAIRE JONES. Italy crisis poses dilemma for Draghi over ECB’s next step. Central bank hawks want to keep plan to end QE but market jitters could force rethink. Italy’s crisis gives the European Central Bank tough choices as it tries to tread a line between containing market turmoil and sticking to plans to end its crisis-era monetary support. The dilemma is made even more acute by the nationality of the ECB’s president. 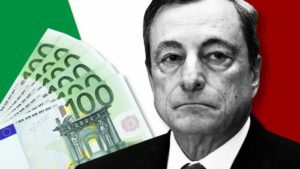 Mario Draghi, head of the Bank of Italy before his ECB appointment, knows better than anyone his country’s importance to his current mandate to ensure eurozone stability. Investor fears over Italy were uppermost in the crisis over the euro that has dominated his tenure in Frankfurt, prompting his celebrated promise to do “whatever it takes” to save the single currency. Now fears over Italy’s political stability are again sending markets gyrating as investors parse the probability of a populist coalition in Rome or a fresh election that in effect would be a referendum on the euro. Events in Italy are likely to have knock-on implications for Mr Draghi and his fellow policymakers — with the added complication that any ECB action will be scrutinised for signs that its president is exerting undue influence in Rome. Italian officials say President Sergio Mattarella has spoken with Mr Draghi, among many others, during the country’s political crisis. But they deny Mr Draghi forced a controversial decision last weekend by Mr Mattarella to reject Paolo Savona, a Eurosceptic economist, who had been slated to become the country’s next finance minister. Mr Mattarella’s office declined to comment on the president’s “private telephone calls”. As they were locked in negotiations to form a government on Thursday, lawmakers from Five Star and the League, Italy’s two leading populist parties, said they would be worried if Mr Draghi had intervened improperly in domestic politics, but were more concerned about whether — and how — the ECB was affecting markets. “The spread has spiked: it would be useful to know how much debt the Bank of Italy and the ECB have bought compared to the norm? Have purchases gone down?”, wrote Carla Ruocco, a Five Star MP, on Tuesday, at the peak of the market turmoil, on Twitter. At the start of the year the ECB’s hope was that strong eurozone growth and a clement political climate would in 2018 allow it to draw its €2.4tn quantitative easing programme to a close and begin raising interest rates around the middle of next year, following the US Federal Reserve and the Bank of England in normalising monetary policy. But that timetable — already threatened by a slowdown in growth in the opening months of 2018 — has been placed further in doubt by the events in Rome, which sent Italian government borrowing costs to their highest level since the nadir of the region’s sovereign debt crisis. “We feel it is enough for the ECB to take a more cautious path than we had earlier expected, and we now expect the ECB to initiate its first hike in September 2019,” said Ioannis Sokos, economist at Nomura. The other dilemma for the ECB would be how to respond if political events in Rome triggered greater concern among investors — perhaps if speculation of an exit from the euro area triggered a flight of deposits from Italian banks, many of which remain in poor shape. One tool for the ECB would be its ability to buy bonds in unlimited quantities under what is known as its Outright Monetary Transactions programme, to stem a run on deposits. But it would only do so if Rome were willing to enter into a fiscal adjustment programme sanctioned by Brussels. Such a move would be anathema to a Five Star-League government. Any attempts to soften the conditions would be fiercely resisted by ECB hawks, notably the Dutch and German central bank heads. The Bundesbank maintains that Rome needs to decide for itself whether it is prepared to pay the price of remaining within the currency union. As for QE, since the programme began in March 2015, the ECB has bought €341bn in Italian bonds. It is still buying around €4bn in new bonds a month. Earlier this year it was considered likely that the bank’s next policy meeting, on June 14 in Riga, would be an occasion to firm up its plans to ditch the crisis-era stimulus, with hawks adamant that the bank should announce a firm end date for QE. But the longer the turmoil in markets continues, the less likely progress in June becomes. The ECB has pledged to reinvest an average of €15bn a month over the first four months of next year, using the proceeds of government bonds bought under QE that have now matured. There is no breakdown by country for the reinvestments, but the figure for Italy would be around €2bn if in the same proportions as those of existing purchases. Clearer guidance and hints at a lengthier timetable for reinvestments and rate hikes would reinforce the message that monetary policy in the eurozone will remain loose long after QE ends. No one more than Mr Draghi will appreciate how much such decisions might appear intensely political. Any role that the ECB president plays in handling the political turmoil in his homeland is likely to remain behind closed doors — with technocrats aware of the danger of drawing populists’ ire by looking as though they are interfering in the democratic process. During the 2011 sovereign debt crisis, in which Silvio Berlusconi’s government was forced to step down, some Italian critics accused EU governments of plotting the media mogul’s ouster alongside opposition parties. This article was first published by the Financial Times on the 1st of June, 2018. Claire Jones writes about the eurozone economy for the Financial Times. She is based in Frankfurt and before that was in London covering the Bank of England. Additional reporting by James Politi.